The Johnson County Community Foundation (JCCF) strives to be the philanthropic leader in our community, and one way we do this is by connecting through our Cultivating Charitable Giving print and electronic newsletters. We keep our community informed and educated about planned giving, grantmaking, key community causes and much more. 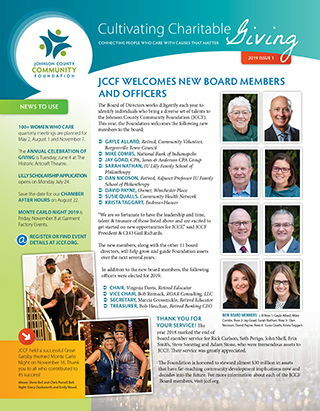 JCCF produces the newsletter, "Cultivating Charitable Giving" regularly to keep you informed and connected.